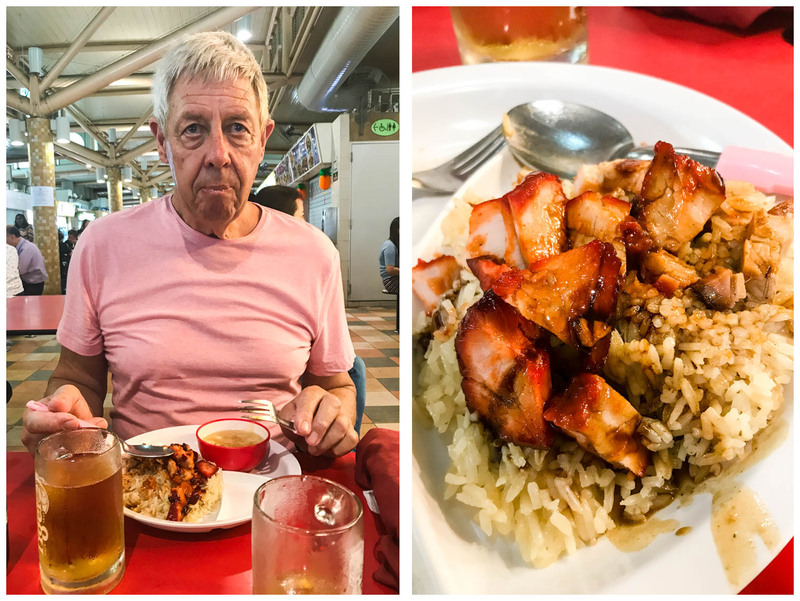 We picked up a good deal for flights from Vientiane to Singapore and were quite happy to return after an absence of about three years. 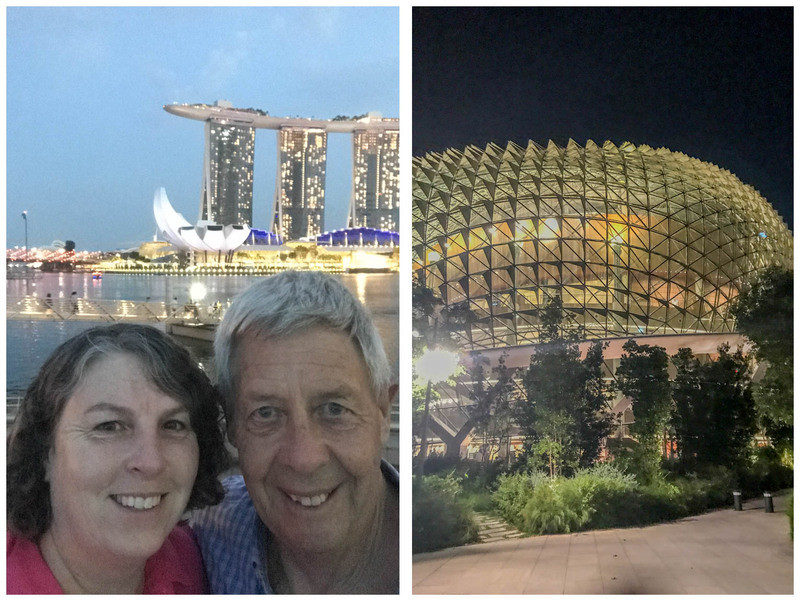 We headed down on Thursday and returned on Sunday - just enough time to eat, explore and do a little shopping. 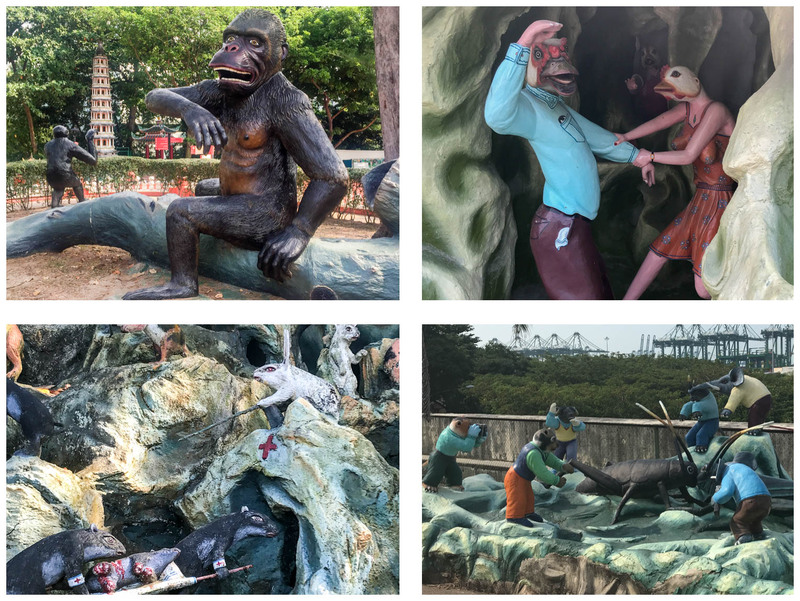 On Friday we headed out to Haw Par Villa. 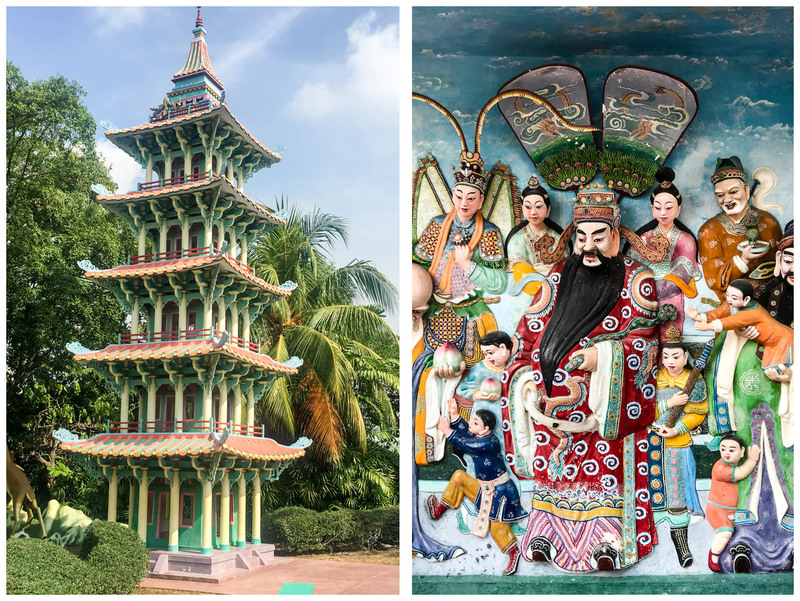 It has been on my radar for a long time, but it was never quite the right time to slot it into an itinerary until now. I knew a bit about it, but basically told Andrew nothing except that it was "quite different" and he would either love it or hate it. It turned out the weirdness landed on the love side for him. 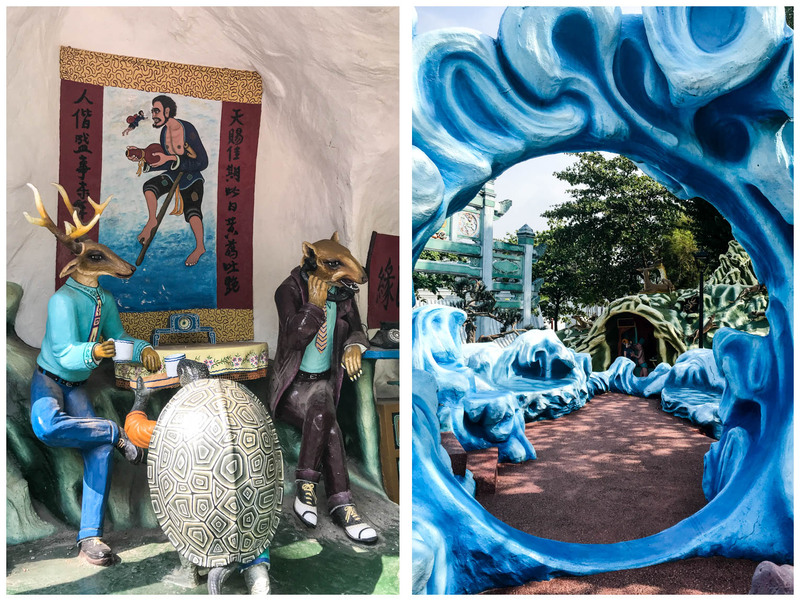 Formerly known as the Tiger Balm gardens, it was built by the Tiger Balm family over 8 Ha. But quickly heads to the bizarre. Welcome to the 10 courts of Hell. 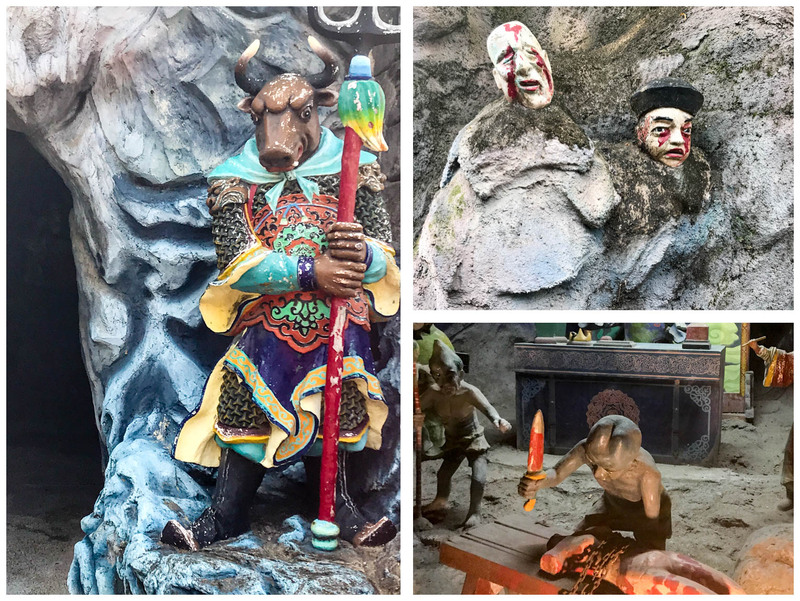 But alongside there are King Kong apes or Medical bunnies and multiple items that just make your head shake in bewilderment! Beyond words really, but worth a couple of hours there and back. 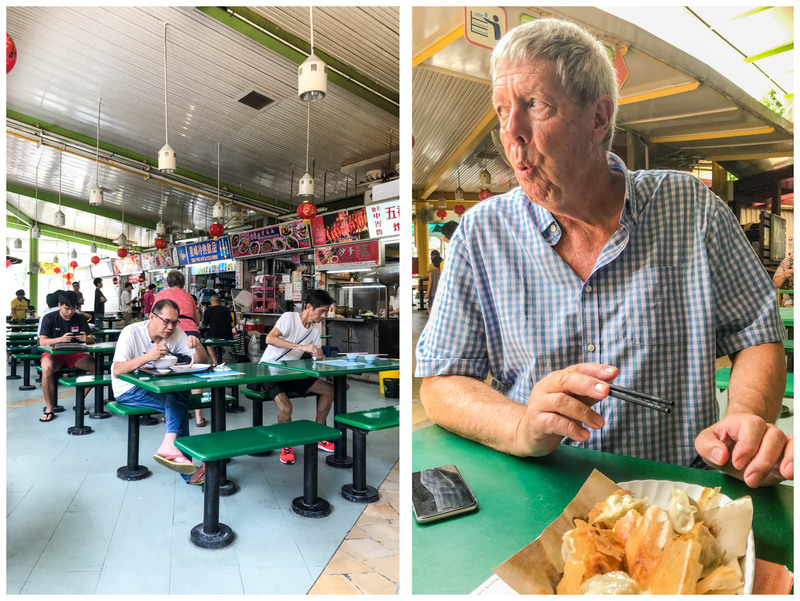 This trip we searched out a couple of recommended hawker food courts away from the pure tourist areas. The 1st introduction was Alexandra Village food court. While we had recommendations of where to go, in the end we used the traditional technique of choosing the longest line and ordering what the men in front of us ordered $3.50 each later we had a plate of delicious mixed pork and rice. 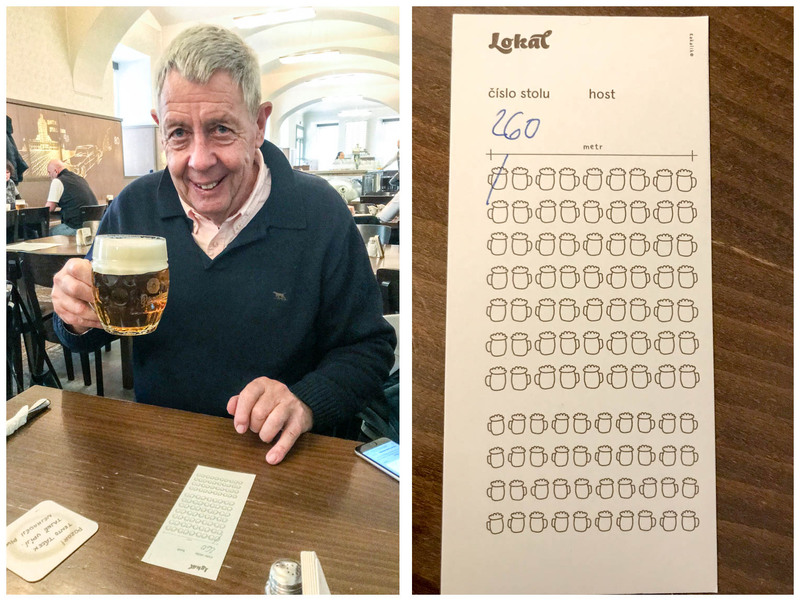 The beers would have cost more than the meal itself! Apart from some shopping we spent some time riding buses between destinations. It was good to see the apartment blocks and greenery and all the trappings of a modern efficient city. Rather a contrast to life in Vientiane. Overall a great short break, even if the beer was amongst the most expensive in the world. 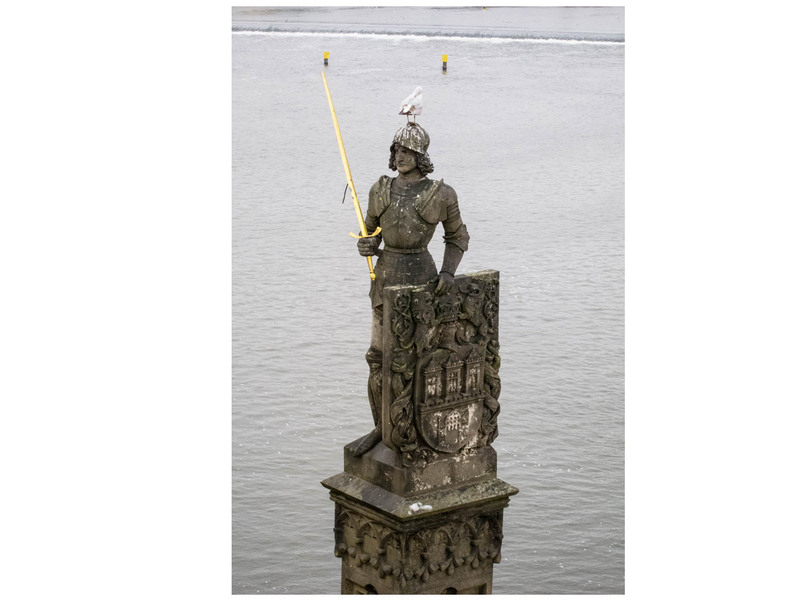 Our time in Prague was a little odd. 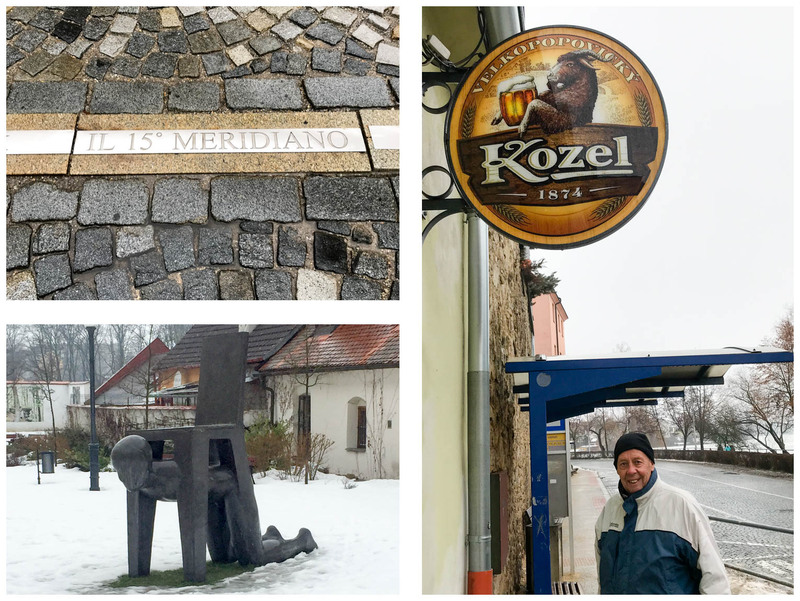 Rather than planning our time in the city, a lot of our attention focussed on dealing with the items we lost in Kutna Hora. From buying new toothbrushes through to new iPads, nothing critical, but the whole process was an unsettling distraction. 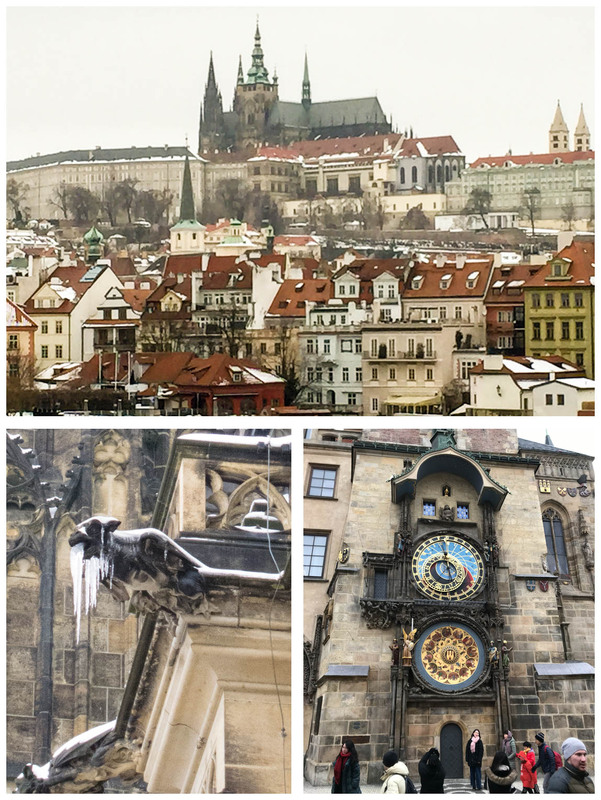 Wanting to make the most of 2 days in Prague we decided to head straight for the castle. It is an iconic part of the city. Having endured the security screening process, we slipped and slided our way around the snowy inner courtyards. Andrew had suggested before we arrived there would not be many tourists about in the middle of the off season. How wrong was he? Everywhere we went lines and groups. I was there more than 20 years ago and it was busy but now in summer we can only imagine the total tourist overload. 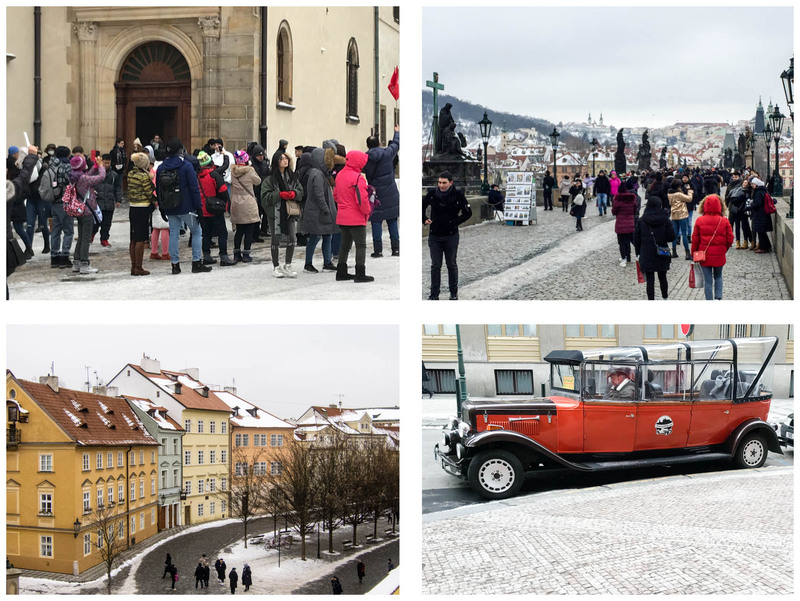 Prague is geared to take the tourist dollar. Every church, every display or anything with a door has an entry fee. One little gem worth paying the entrance fee for was the St Nicholas church. 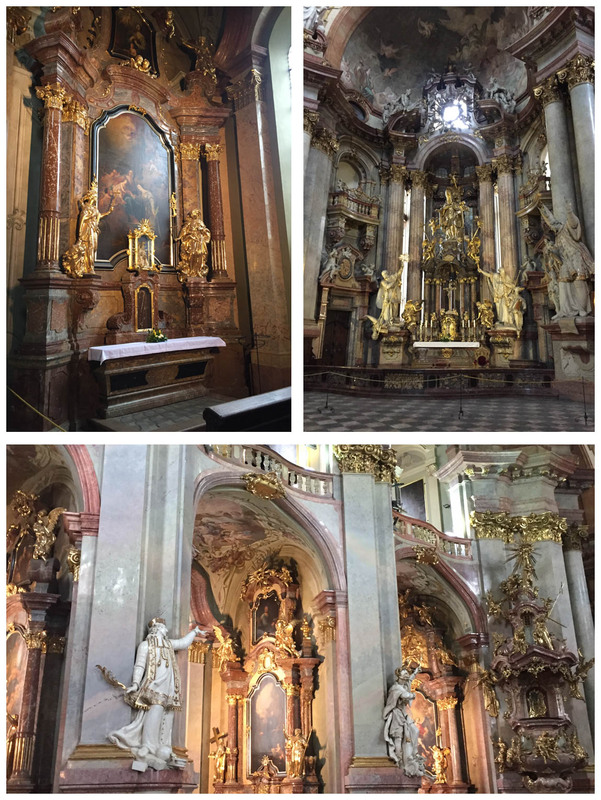 Baroque exuberance at its best. Our final night was back to Munich. Racing down the motorway with the sound of clingwrap ringing in our ears. Clingwrap is not particularly aerodynamic and it was a pleasure to drop the car off 1 day early. Even though it was damaged it, the return was a very easy process. In Munich city we shopped and went out for a good meal at a modern brewery. Good beer and food and they closed the street down for us. Well, not just for us, but for a pre-Carneval dance. Quite a lot of effort obviously would be spent practicing for the annual Carneval events - and a bit of beer drunk as well one would imagine. It started out as a normal holiday day. Breakfast, luggage into the car and on the road. It finished with time spent in a Czech police station and a roll of cling film. 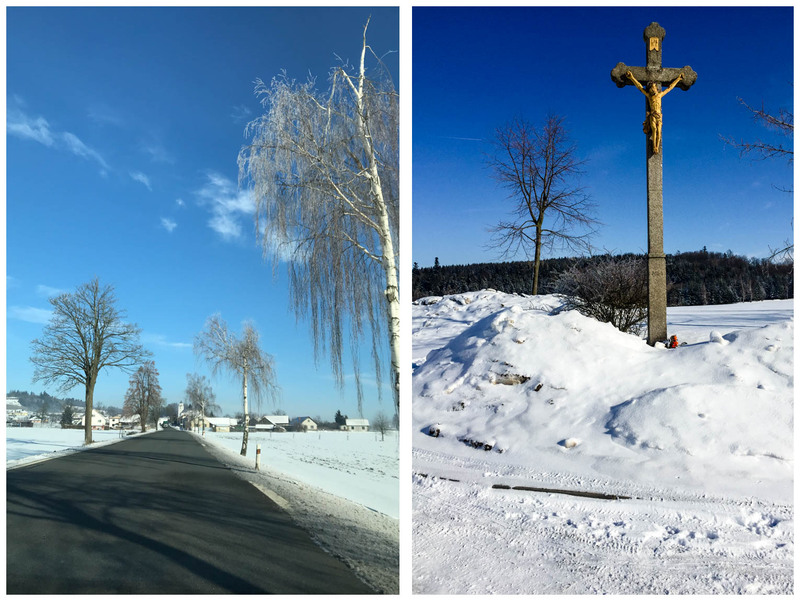 It was beautiful blue sky day and we headed to the Unesco World Heritage pilgrimage church of St John of Nepomuk, at Zelena Hora. It is a pretty site, especially with the snow on the ground. 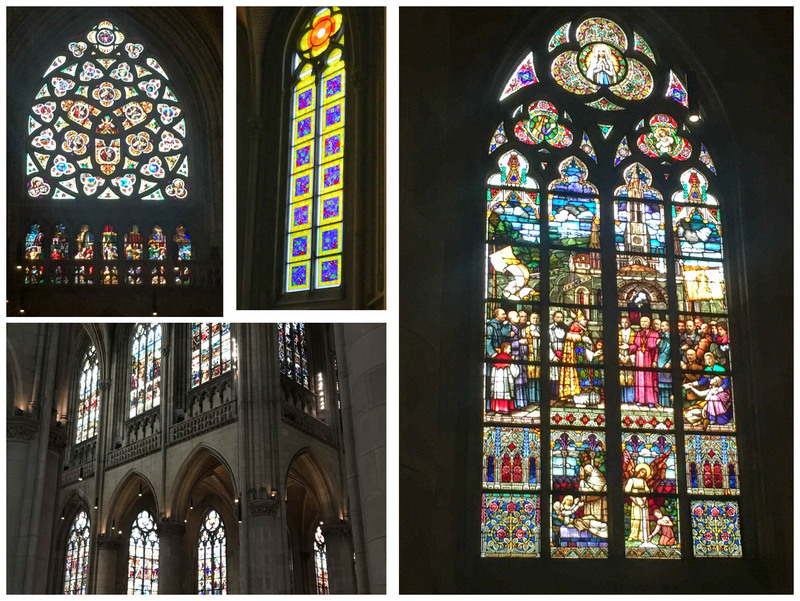 The church sits inside an outer wall which takes the shape of a 5 pointed star. The church itself wasnt open mid-week in the middle of winter. 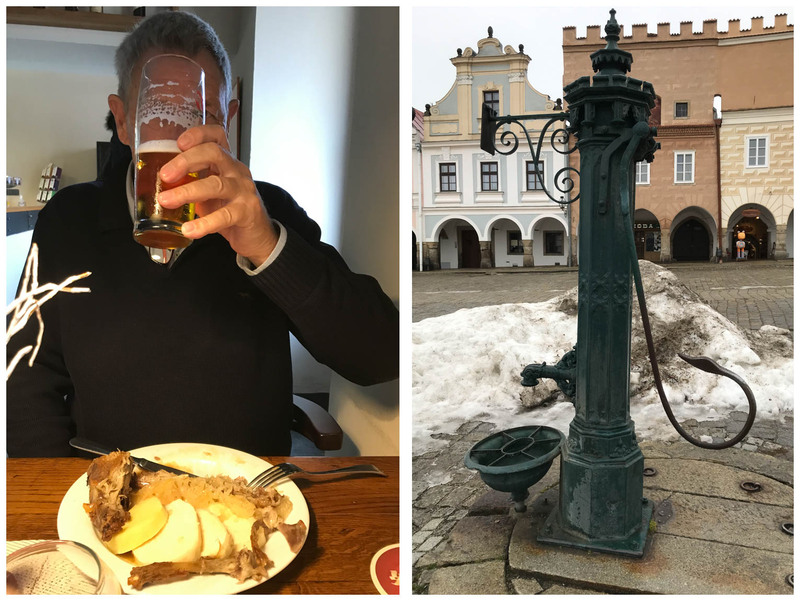 Charmed, we drove on to our designated lunch destination of Kutna Hora. 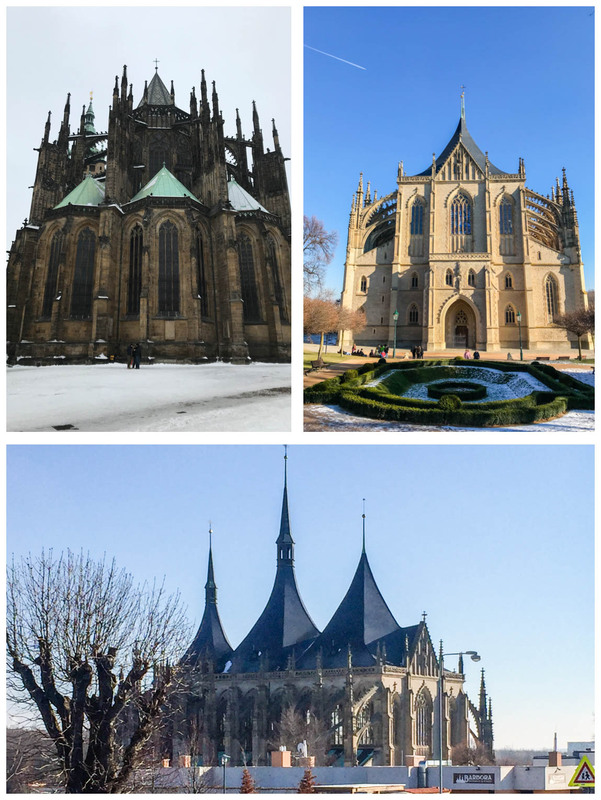 Famous for it's Ossuary (Bone Church) and Gothic Catherdral of Barbora. 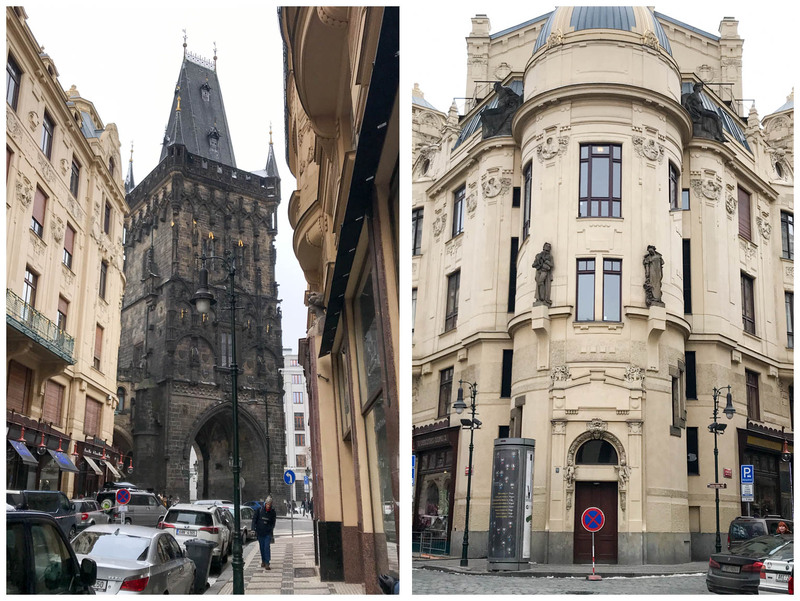 We parked nearby on a residential street, near a few tour buses and headed off for lunch at Cafe Barbora. It was good meal and we walked around the church and colonnades before heading back to the car. 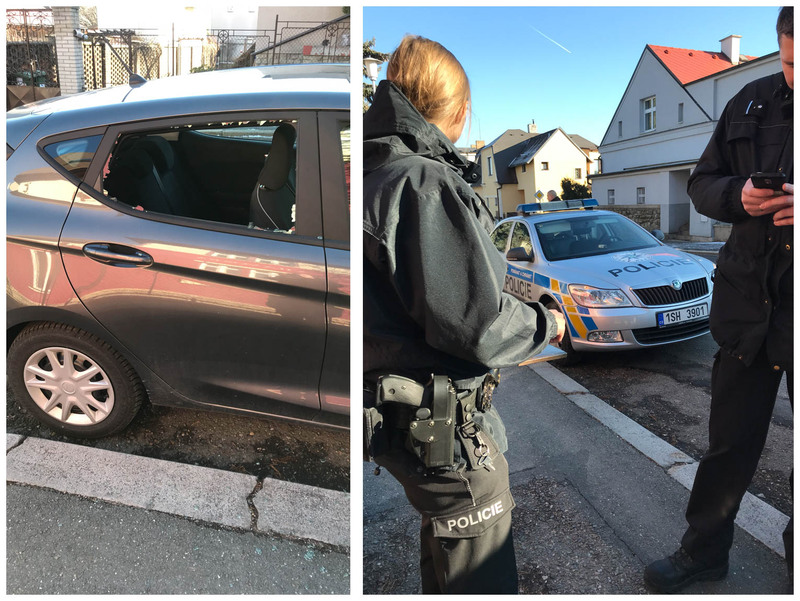 Some **** had broken into the car and taken the two small backpacks sitting on the backseat. Of value in the bags were 2 iPads, a work laptop, Andrew's hearing aids and a little cash. Of no value, but much inconvenience by their absence, were 2 jolly good daypacks, cables, earphones and various useful bits and pieces that we had added to our travelling kits over a number of years. The suitcases remained untouched. We had to call the police who turned up quickly. Neither of the officers spoke any English. My German wasn't good enough for the conversations needed, and we turned to Google translate to act as an interpreter. The forensic team arrived, dusted the car for prints, and after an hour or so, we all went to the police station. We sat in the waiting room and waited. We made a list of the things we could think of in the bags, and their value, and we waited. We called the car-hire firm and they said bring the car back to Germany as there were no repairers in Czechia. Eventually we found out we were waiting for a translator to arrive. When she arrived it became so much easier for everyone. We had to be interviewed and make the police statement . Our interpreter worked seamlessly between English and Czech, even so the process took forever. On the positive side, the 2 police, one male, one female, and the interpreter, were lovely people and there were a few laughs along the way. Statement done, the key piece of advice the Inspector gave us was - wrap the broken window in Cling-film. On leaving the police station, we drove with the wind whistling through the car, to a supermarket to procure said cling-film. We proceeded to wrap it around and around the window. We were both very surprised how effective it was on the 1 hour slow journey, on busy roads, from Kutna Hora to Prague. We were pleased to see the hotel and we deposited the car in (expensive) underground car-parking and proceeded to ignore the glad-wrap window for the next 2 days. The day was a surreal experience. On returning to Laos we were informed by the police the bags were found - minus the expensive technology - but Andrew's expensive hearing aids were in the bag. We are currently working through the process to get the bags returned to Laos. Fingers crossed!! 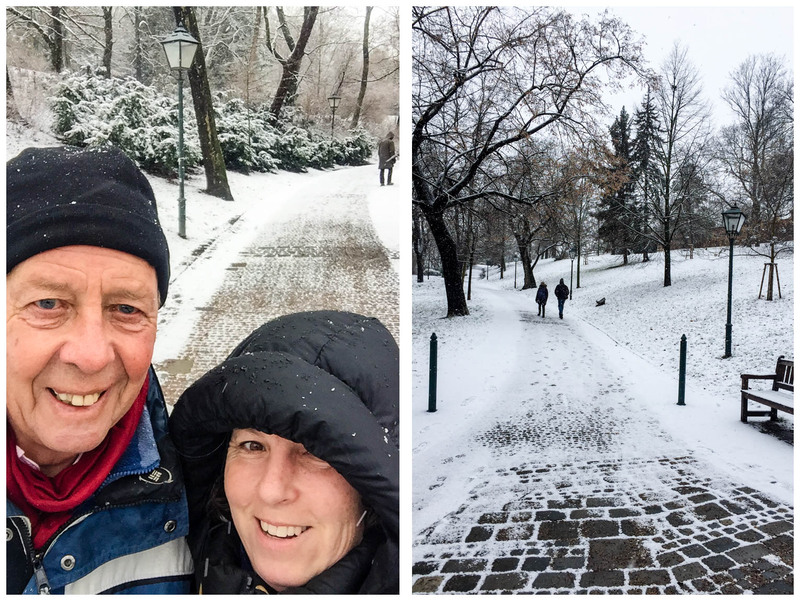 With a limited amount of time allotted to the city we had to brave the heavy snow falling in the morning. By lunchtime it had cleared and there were even blue-sky periods. 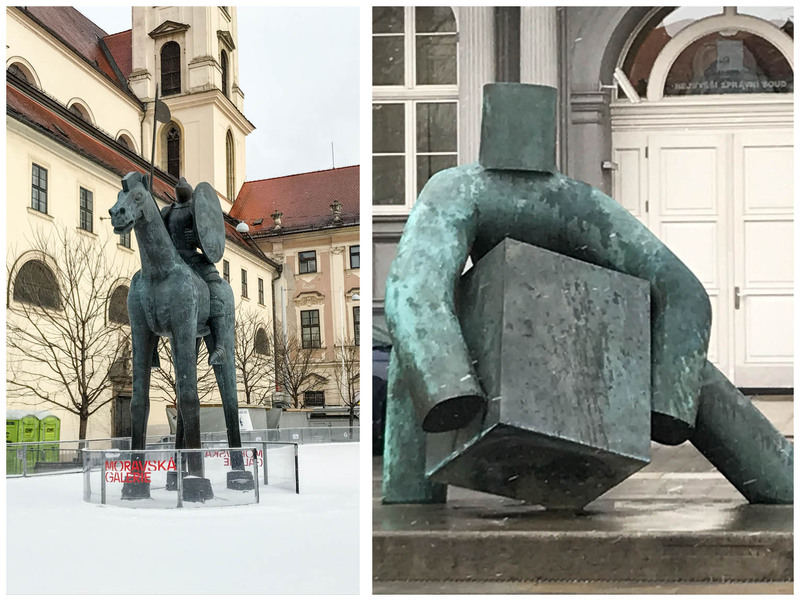 I had been interested to check out the iconic statue in Moravian square, which you are supposed to walk under and look up - but he was smack in the middle of the town winter ice-rink - so not possible. However there were plenty of other installations and art in the city centre. 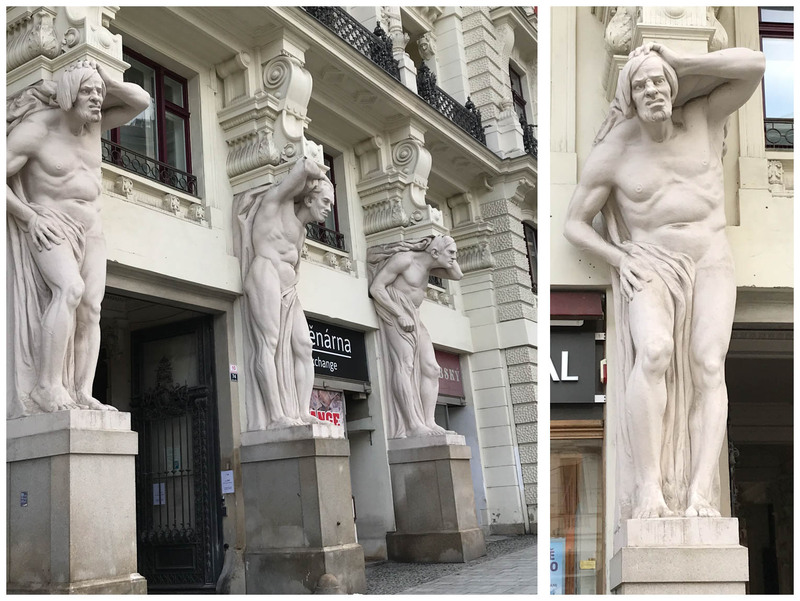 The interesting sculptures on freedom square included 'the four morons' which date from 1928. Looking at their faces you can understand why the guidebooks describe them as '4 morons, trying to hold up the building and their pants at the same time. Which segues into our favourite moron, who yet again ordered a pork hock that would have fed a Lao family for a month. This is just a repeat of Bucharest a year ago. 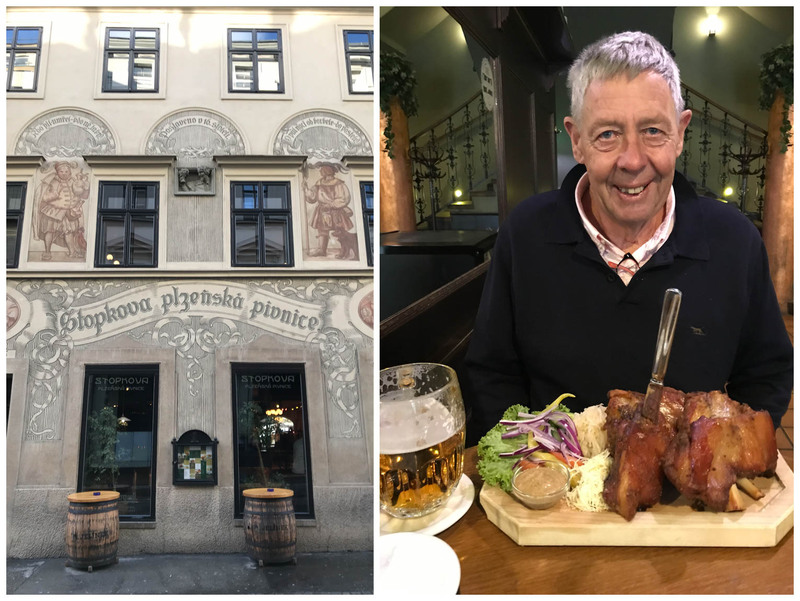 Lunch at Stopkova was good hearty stuff and yet another opportunity for to partake in the very good Czech beer. We woke to see it had snowed heavily overnight and it was still snowing. We quickly revised our driving plan for driving on the minor roads and decided to stick to the larger secondary roads. The weather forecast said the situation would improve as the day went on so we set off. It turned out the worst of the snow situation was driving down the sloping driveway at our pension, and the rest of the journey wasn't too bad - in snow terms anyway. The day was characterized fog, followed by periods of sun, returning to fog. Our 1st stop was the town of Jindrichuv. It was Sunday, and having parked the car we weren't overly hopeful we would find a cafe open. But on the town square there was a cafe, and coffee and cake. Chocolate cake for Andrew and a Linz biscuit - just because of the fact we hadn't found any pies in Linz itself. Warm and re-caffeinated it was time for a walk around. Until I saw these photos together I hadn't realized how consistent the colour palate had been there. These painted buildings were certainly typical throughout the areas we visited this year. Back onto the fog/sun road, driving through plenty of plantation forest we made our way to Telč. 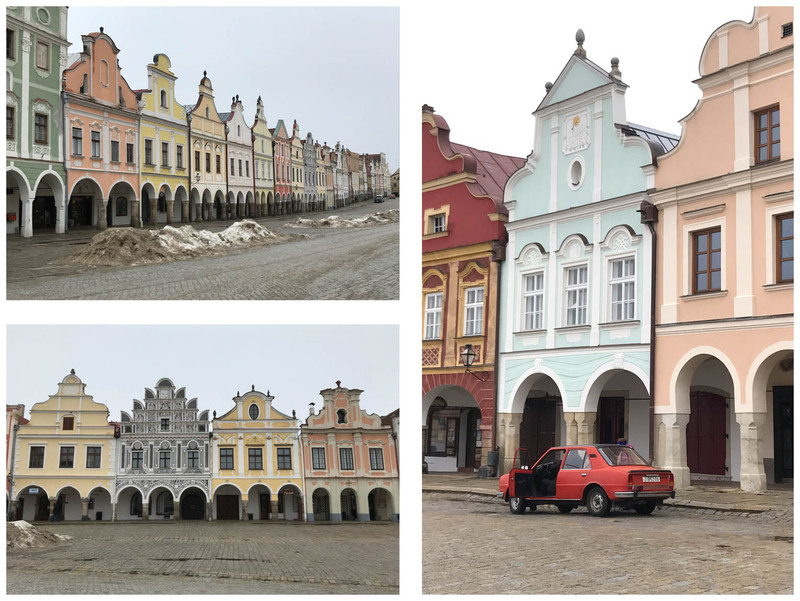 Telč was one of those places that when you arrived, it took your breath away. 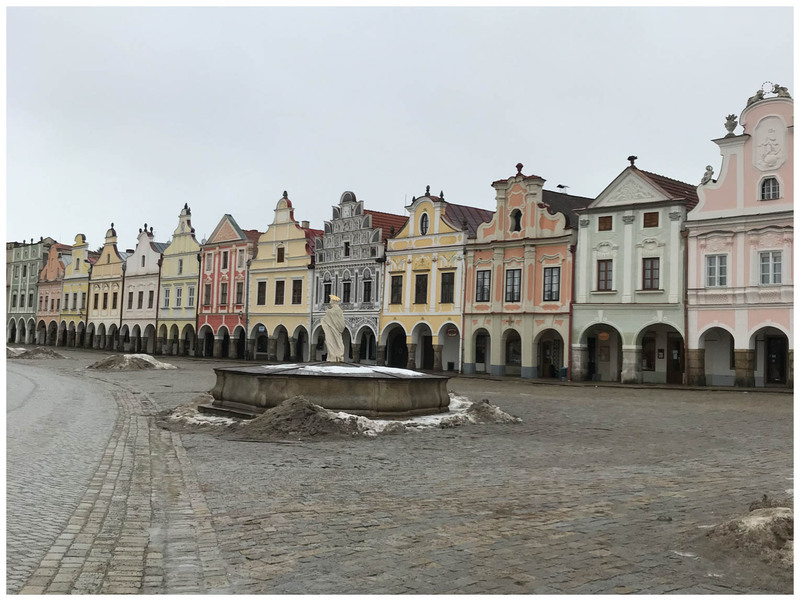 The painted houses around the town square were 'picture-perfect'just like in the guide-books. The 1st goal was to find food and we spotted a small cafe on the square that had plenty of people in which was always a good sign. Turned out they were 40 Chinese tourists on a bus tour, but the food was still good. Changeover day dawned clear, and we were on the road by 9:00. Our 1st point of call was a fuel station so we could buy an Austrian highway toll sticker so that we wouldn’t be fined on the motorways on our journey to Linz. 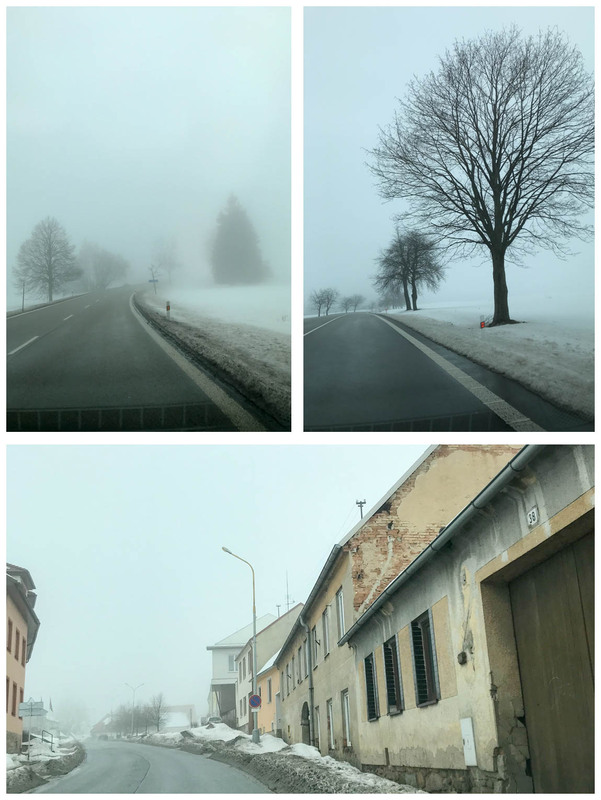 The drive from Hinterglemm was about 3 hours in total, mainly on the motorway after the 1st hour – today was about the destinations and not the journey. Arriving into Linz, we parked the car and set off to find food. We ended up going Italian at an German chain we have been to before, Vapiano. 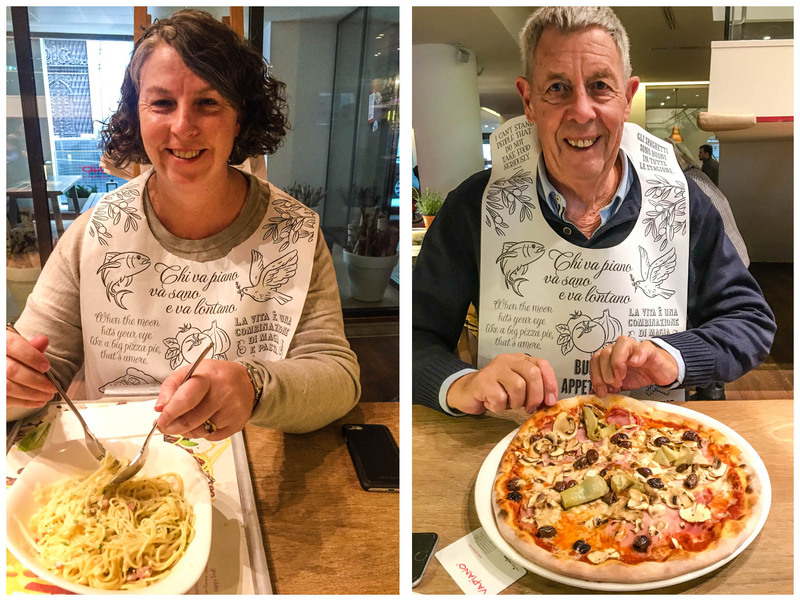 Lots of other people were wearing disposable bibs – so we thought; eat like a local! 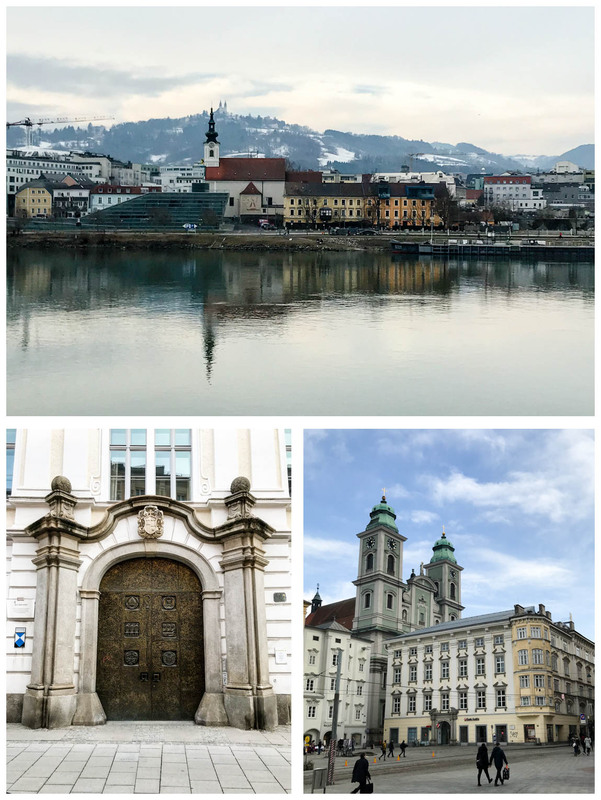 Linz was a surprisingly appealing smaller Austrian city. It has had an intense industrial history, and plenty of big factories were still visible on the city outskirts. 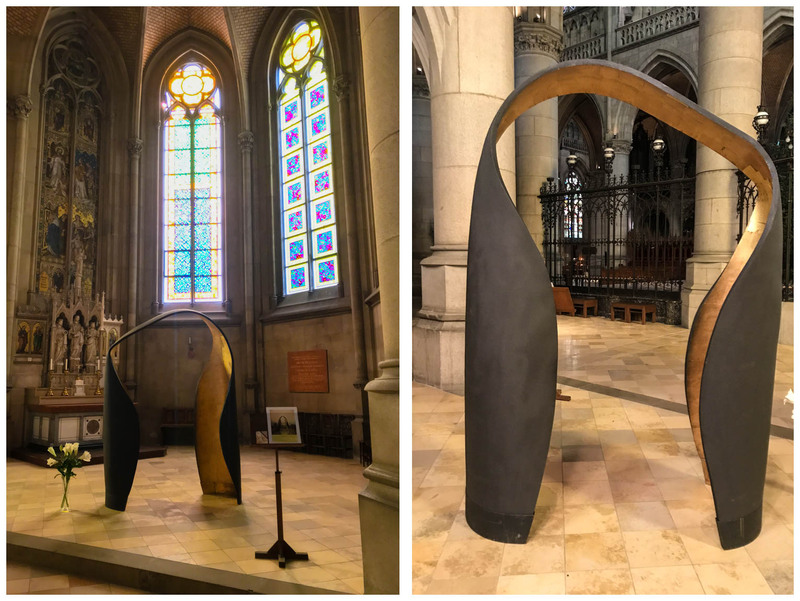 But it has also been a European city of culture and is working on that aspect with a modern art gallery and art installations. The old part of the city has the lovely churches and buildings. One thing Linz is famous for is Linzer torte. I had read in the guidebook, plenty of bakeries selling this local icon, and had expected it to be easy to find. The only one we saw was a dried up version in a café which I scorned because ‘we were going to see them in every 2nd store. Nope, not one. 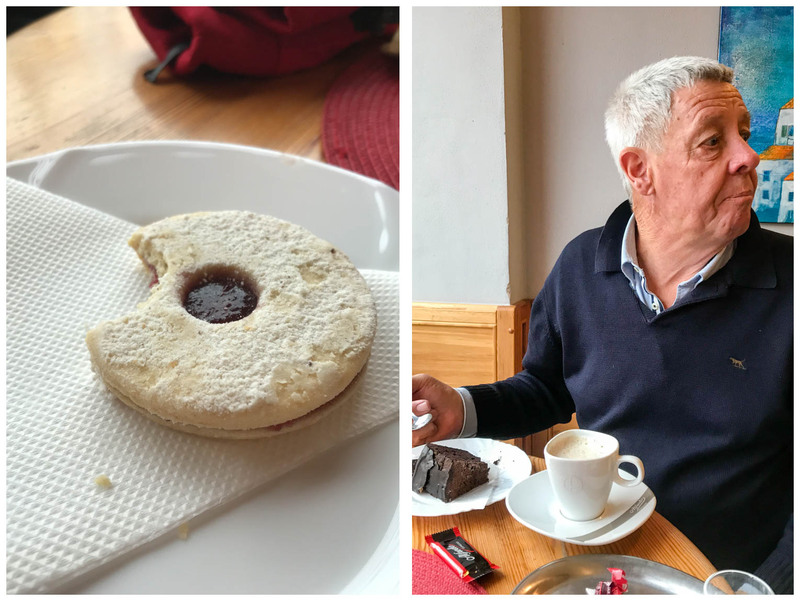 I did have a Linzer biscuit the next day in Czechia, but it wasn’t quite the same. Then it was back on the motorway and into Czech Republic for an overnight in Cesky Krumlov. We spent the last couple of hours of daylight checking out the castle and old town of this heavily touristed small town. The castle built on the on the rock promontory above the town river is undoubtedly impressive in position, views and buildings. 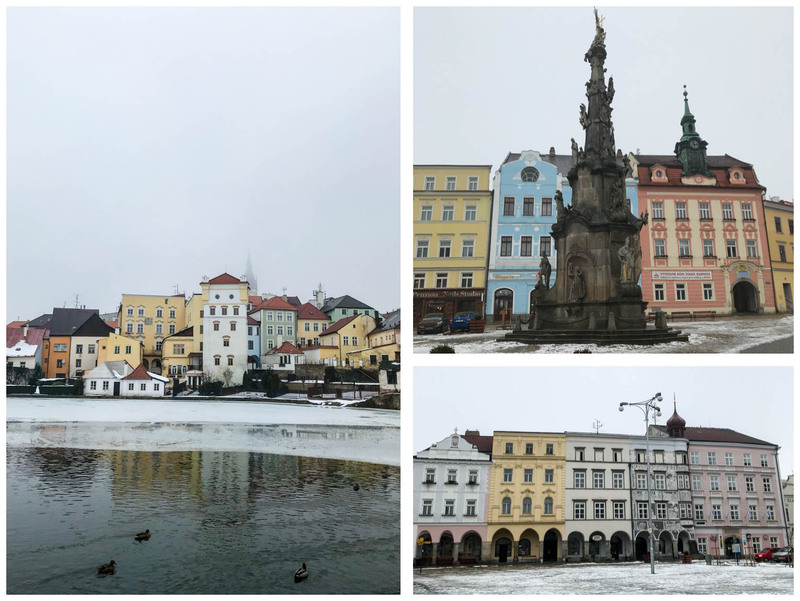 A walk through the small streets, an average meal (probably the most expensive meal in our entire Czech Trip) and we declared Cesky Krumlov visited. End of January means off again for a week of skiing and a week of holiday. 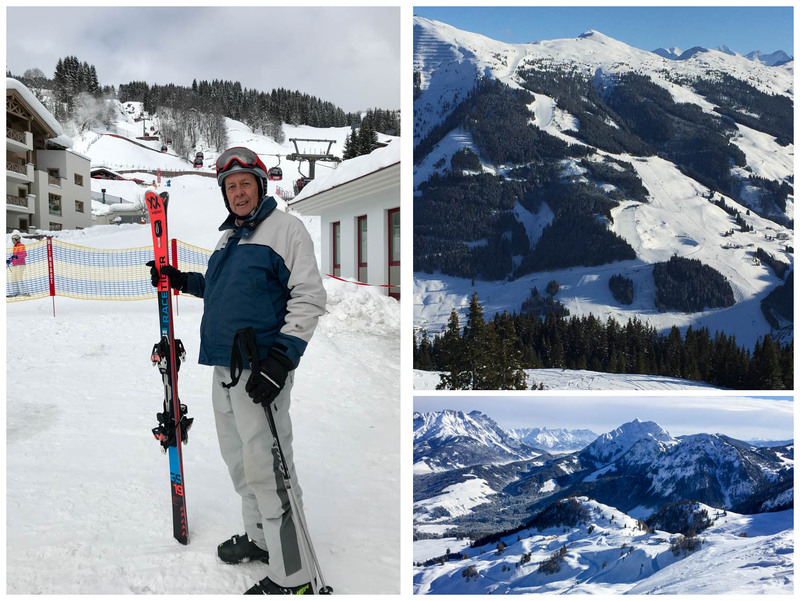 Not wanting to break a winning formula it was a return to Munich for couple of days before heading up into the Austrian Alps and the little ski village of Hinterglemm. Normally before we go Andrew periodically checks the snow reports and we hope for a few good dumps of snow so he will have a good base. 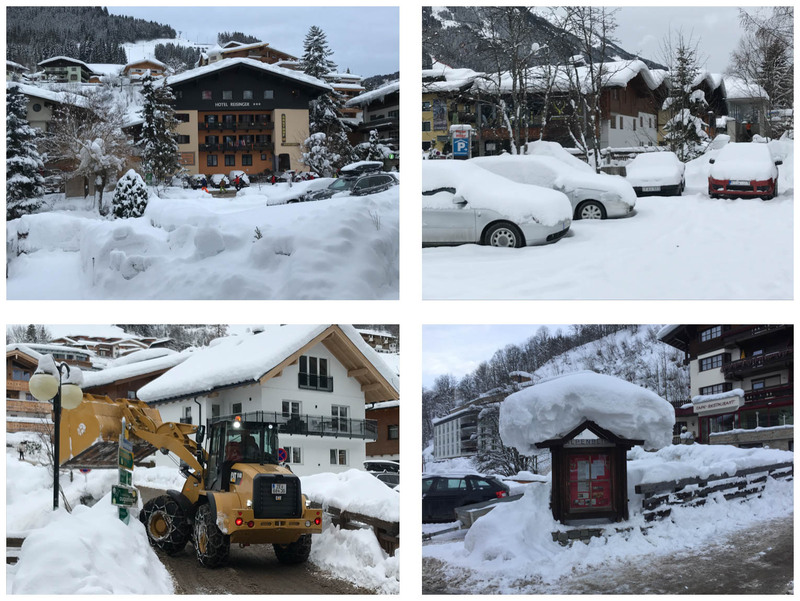 This year it had snowed almost continuously since New Year and the reports of exceptional snowfalls were making the BBC as the highest falls in 30 years. This year the concern was not if there would be enough snow, rather it was would there be too much. At Munich Airport Andrew's bag arrived on the baggage carousel, but mine didn't. 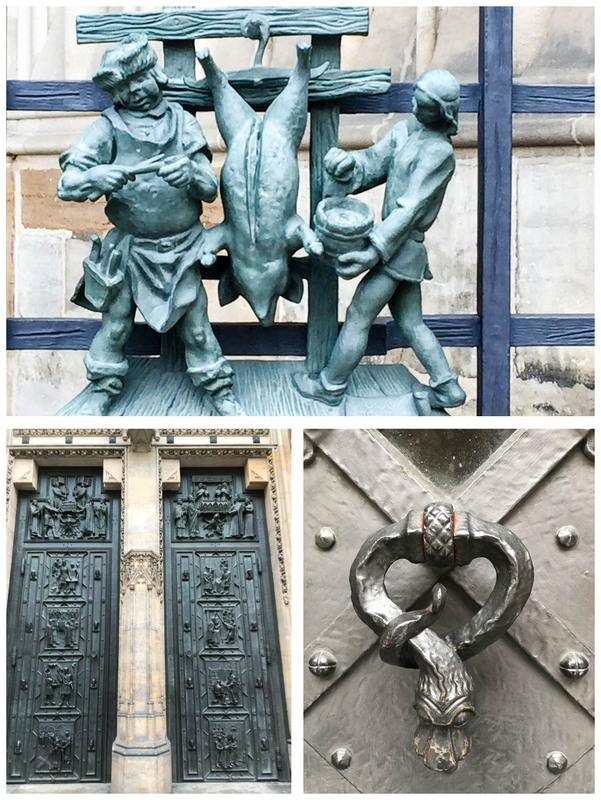 After a talk to lost luggage we were issued with a compensation debit card for €70 (but only €60 could be used because of withdrawal fees) and we were off into the center of Munich. The suitcase was delivered to our hotel the next day, so it was not to bad an inconvenience. 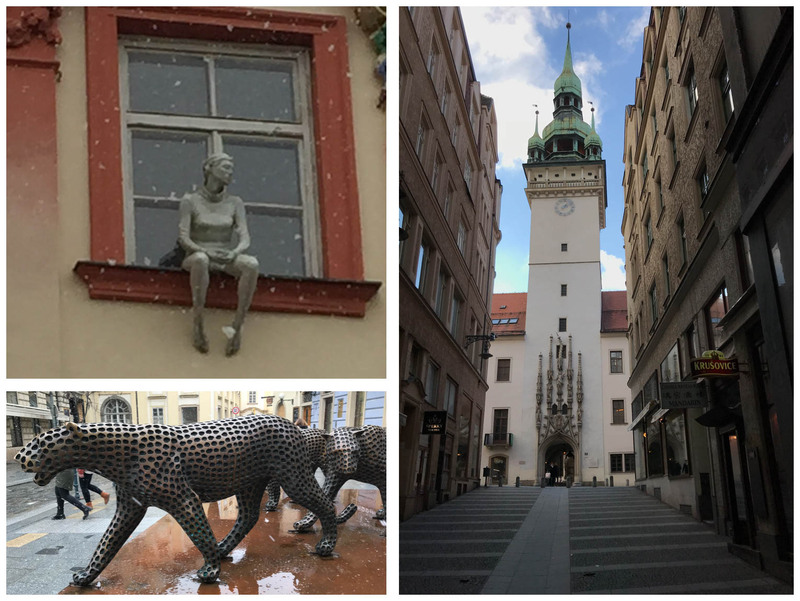 It was -10C, and snowing, but we braved the extremes and went shopping and generally easing ourselves back into European routines. 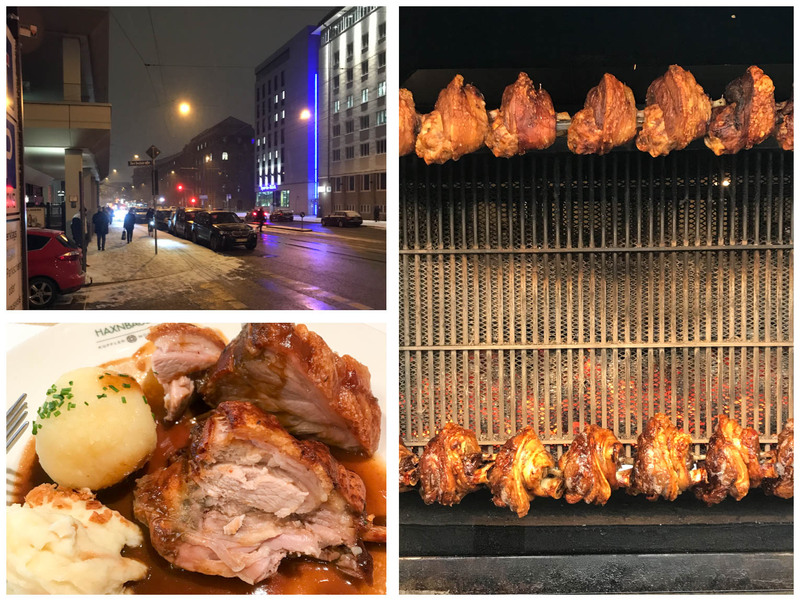 We revisited a couple of our standard restaurant and ate excessive amounts of meat. Early on Saturday we picked up our car for the next two weeks and started off. A journey of 230km and it should take just under 3 hours. 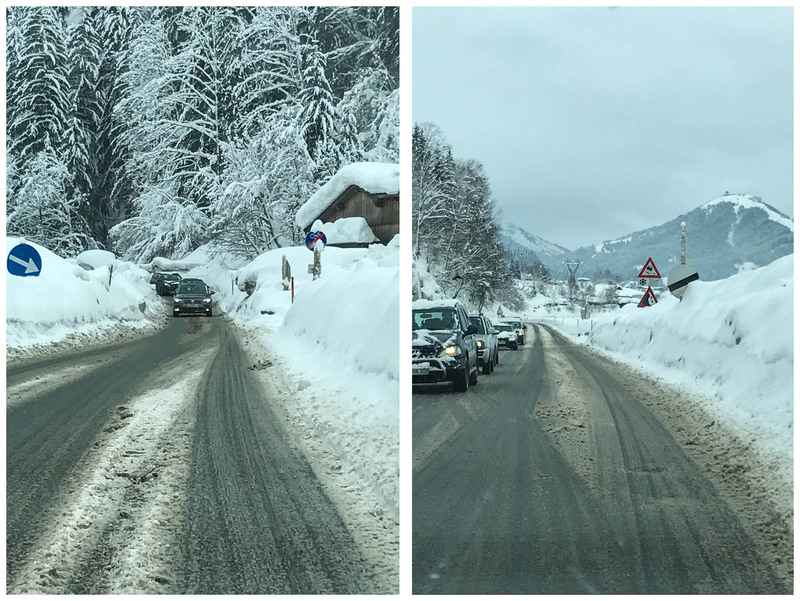 The falling snow, combined with it being Saturday change-over day in ski-accommodation, extended the travel time to 5 hours. We stopped off at the Reidel glass factory outlet store in Kufstein, just over the border in Austria. While the prices were good, we refrained from buying. We took the “back-road” from Kufstein to Hinterglemm and the effects of the massive snows were still evident in the high banks of snow along the roadside. In one place the graded road was down to a single lane. We returned to our previous accommodation at Anna Apartments and got Andrew issued with skies and a ski pass for 5 days of 7. The snow was good, the weather generally favorable with a couple of brilliant blue sky days. Andrew had a couple of technical problems out on the slope including getting his phone so cold he couldn’t take any photos. On another day a very sad face came home, saying he had lost his phone. Luckily, as he stripped off his clothing layers it was discovered that it had slipped out of his pocket and had spent the morning caught up in the sleeve of his jersey. A new security bag was devised for him to eliminate that problem. 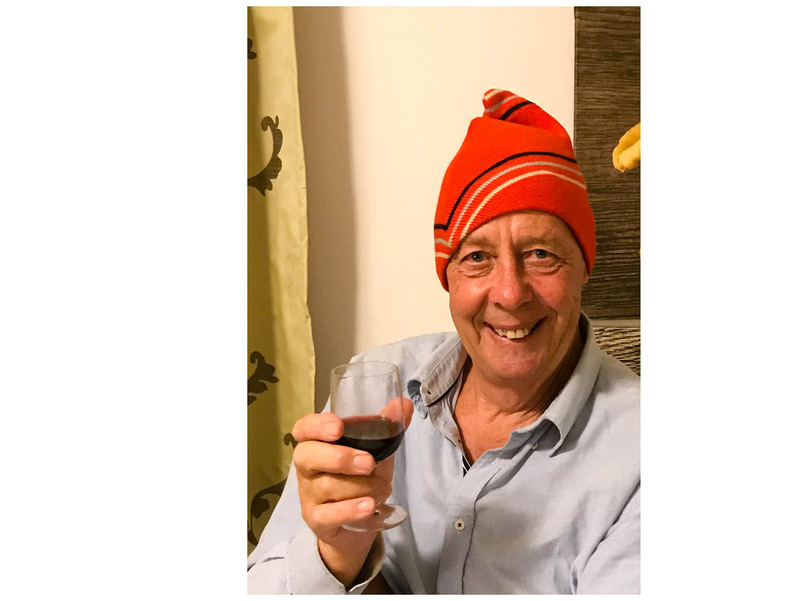 For the skier, it was a enjoyable, but hard week on the slopes. For the worker, it was a constructive week ploughing through some data. 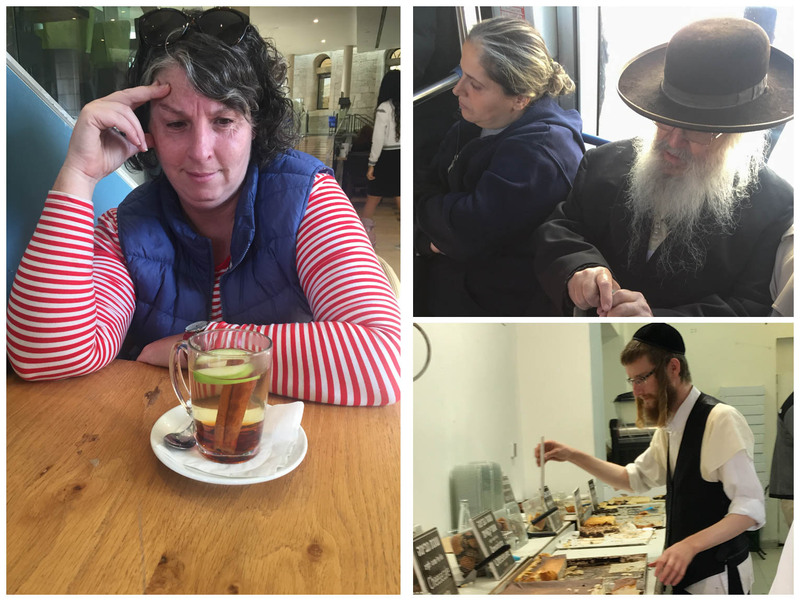 We had 4 days in Jerusalem and it was good to not have to rush to pack everything in. Thst said we still managed to do a lot! We rode the tram to the end of the line to visit the Holocaust Remembrance Center. A large modern building funded with a lot of Jewish benefactor money, there is an extensive series of exhibits on the treatment of Jews in WWII. 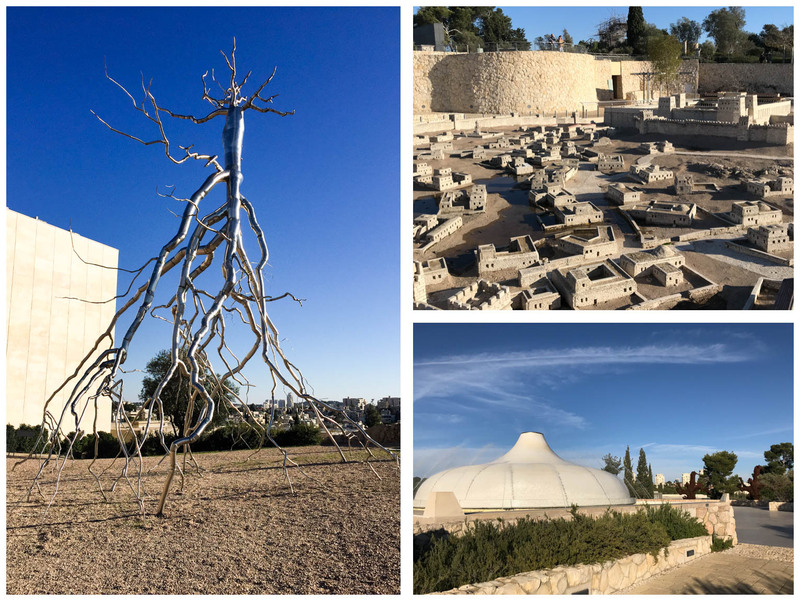 And there was a visit to the Israel museum which is huge. The ancient artifacts and other ethnographic collections are both interesting, and well displayed. There is also a large art collection, but Andrew wasn’t super impressed with it. More interesting with the art collection is looking at who bequeathed the items to the collection. A lot of wealthy Jewish donors, including the best pieces from the collections came from the Rothchilds. The Dead Sea scrolls were...unimpressive (and the week before we were there they we declared fake) but the outdoor sculptures were really good. One day we joined a tour into Palestine. Guided by Palestinians was unashamedly pro-Palestinian, and we felt it was a good opportunity to increase our understanding of some of the issues. We were a group of about 12 people. Our guide told us about places and events as we went. For an Israeli citizen it takes 20 minutes to drive directly to Bethlehem. For a Palestinian it can take 90 minutes as they are only allowed to drive on designated roads and through checkpoints. Inside Palestinian territories there are still Israeli checkpoints, flags and large numbers of Israeli settlers. Our guide pointed out the water tanks on the Palestinian houses as water is controlled by the Israelis and only flows on certain schedules so the Palestinians have to stockpile water. For the Israeli settler houses there are no storage tanks – they have constant water flows. Palestinian movements are highly regulated. 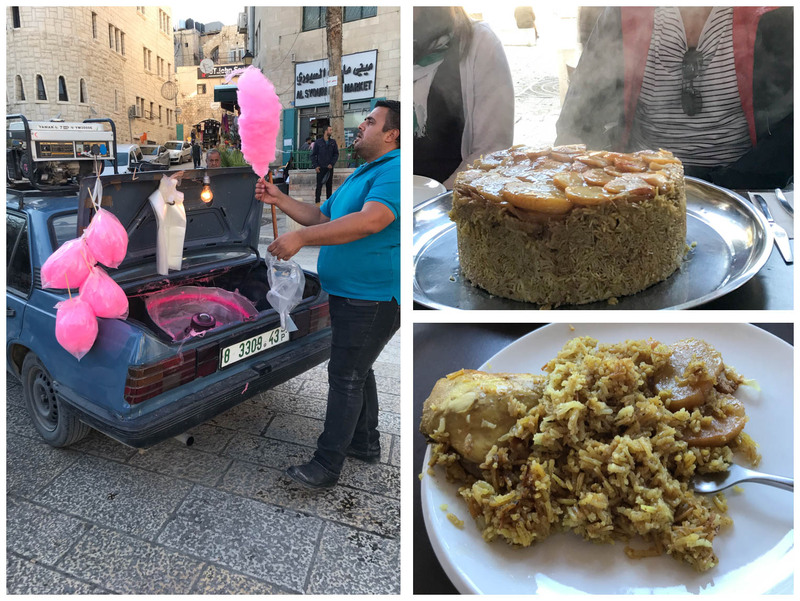 Our guide said, as we looked back across a small gully to Jerusalem, that he had last been there 20 years ago – when he had enough money to apply for a short visit and the documents/permissions to travel. The Palestinian territories are surrounded by Israel and Palestinians are only permitted to leave the country at 1 designated border crossing. The Palestinian passport only allows them to travel to a handful of countries Jordan, Syria, Iraq, Egypt. 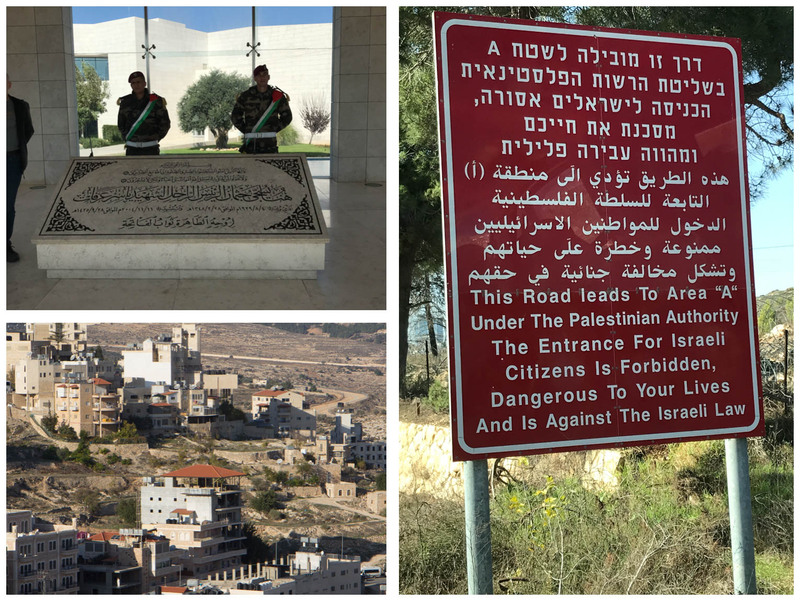 We visited the city of Ramallah and Bethlehem. In Bethlehem we fought our way through masses and masses of tourists all visiting the church at Bethlehem. 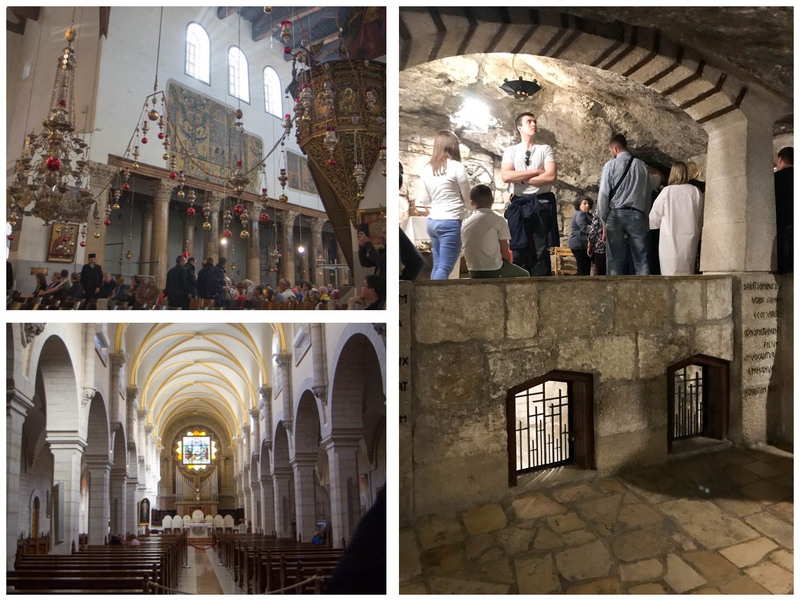 We elbowed our way around the area thought to be the manger where baby Jesus was born. It was tourist hell! 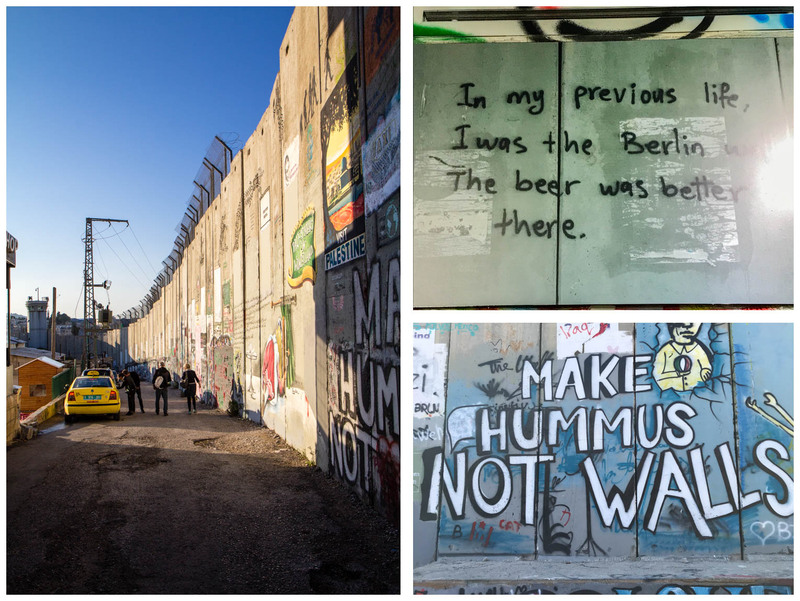 We visited a couple of areas of the Separation wall. 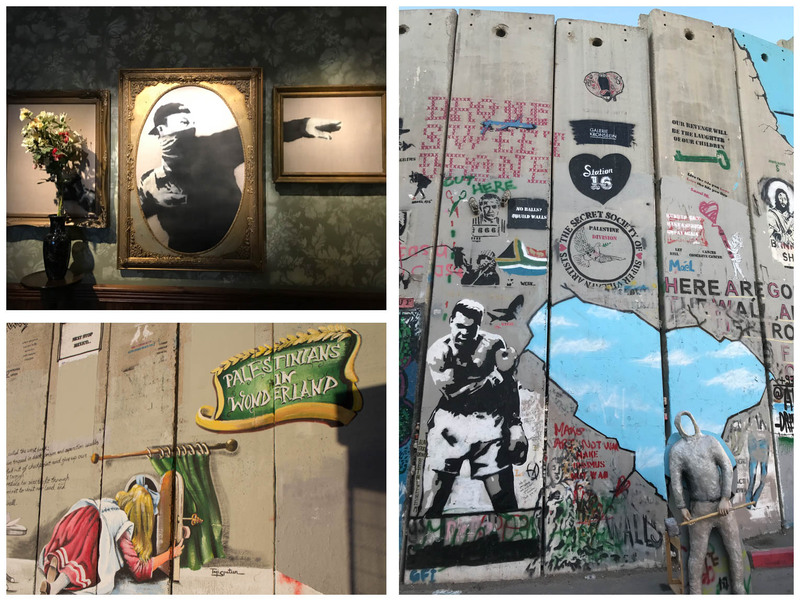 Graffiti by Banksy features prominently and we also visited his "The Walled Off Hotel". The wall itself is over 800km long and rather than following geographical markers it is entirely political. At one point we saw it dog-legging around 3 sides of a house to isolate the Palestinian house. It is hard not to feel for the stupidity of the situation and the way it affects real peoples lives and futures. 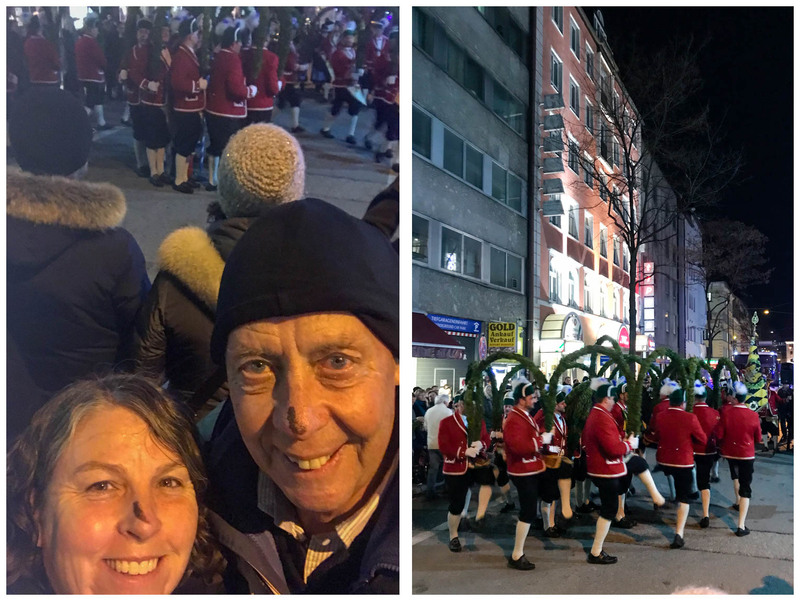 This trip report is not the place for political views but it is hard to see how the two sides can move forward. The Jewish population have the belief this is their promised land. The Palestinians have been shifted off their land or stopped from travelling. These are two completely different starting places and both have views and expectations that are impossible to reconcile with everyone being happy. 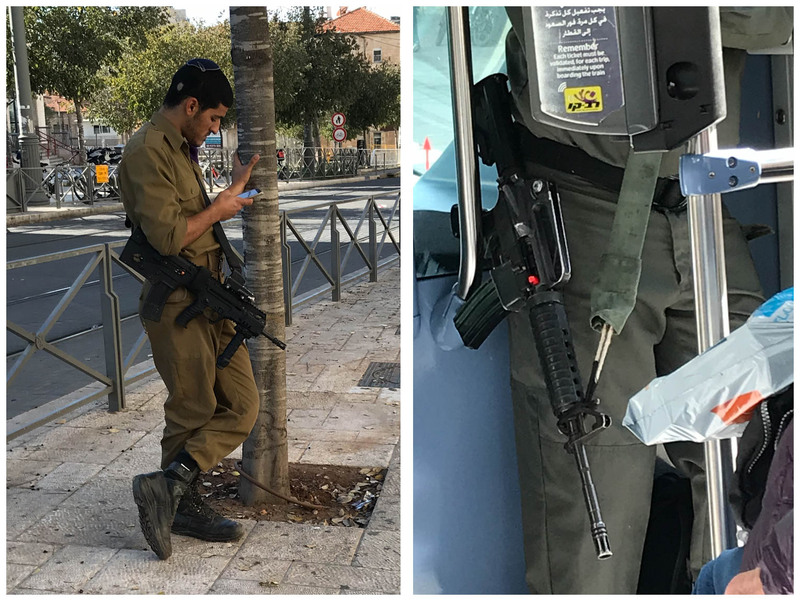 We saw a lot of weapons in our travels and we never became 100% accustomed to them, on the tram, in the street, everywhere. 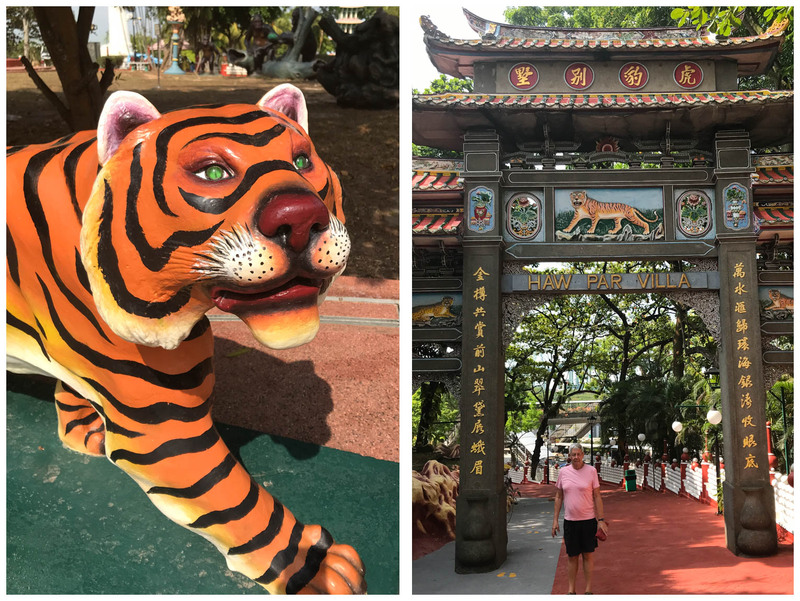 Overall the 3 countries were all very different, but for our short time there we enjoyed the experiences and people we met.